Model #: 5144. Oyster and clam knives are used for prying and opening clam and oyster shells. 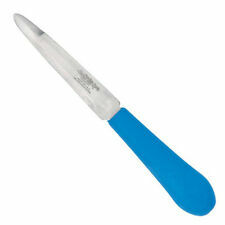 They are made with high carbon steel blades and round plastic handles. Oyster & Clam Knives. For our full line of Ontario Knives. These fruit, vegetable, field, harvesting, table and construction knives feature either a 1095 carbon steel blade with hardwood handles or a 420 stainless blade and a molded plastic handle. These versatile, all-purpose knives may be used to multi-task harvesting, digging and industrial cutting applications. Ontario Knife 05144 Oyster And Clam Knife, 4"
Stainless steel 4" blade. Textured soft grip handle reduces slippage. New Ontario Oyster/Clam Knife 7 5/8" overall. 4" stainless blade. Blue textured composition handle. Can't find the answer you're looking for?. - Any problem with an Item must be reported within warranty period. 1 out of 5 stars - Ontario Knife 05144 Oyster And Clam Knife, 4"
1 product rating1 product ratings - Ontario Knife 05144 Oyster And Clam Knife, 4"
Ontario Oyster/Clam Knife. 7 5/8" overall. Blue composition handle. Note: Products carry only the warranty that may be provided by the individual manufacturer. A lot of them have more than one piece available and as such, the picture is generic and is not the actual item that you will receive. 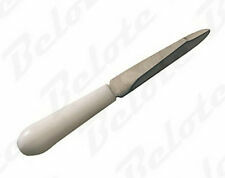 Oyster/Clam Knife is used for prying open clam and oyster shells. Stainless steel blade with molded Dynaflex handle. Blade Steel: Stainless Steel.